Ever feel like your wardrobe could belong to two totally different people? Take a minute to survey the pieces in your closet. You'll notice that there might be an even split between Work You, the person who stays within the sleek, sophisticated, office-appropriate lane, and Weekend You, the person who's known for edgier, cooler, more laid-back looks. Checking off the versatility box while shopping is simple enough, but wouldn't it be great to narrow the divide between your office outfits and off-duty looks even more? 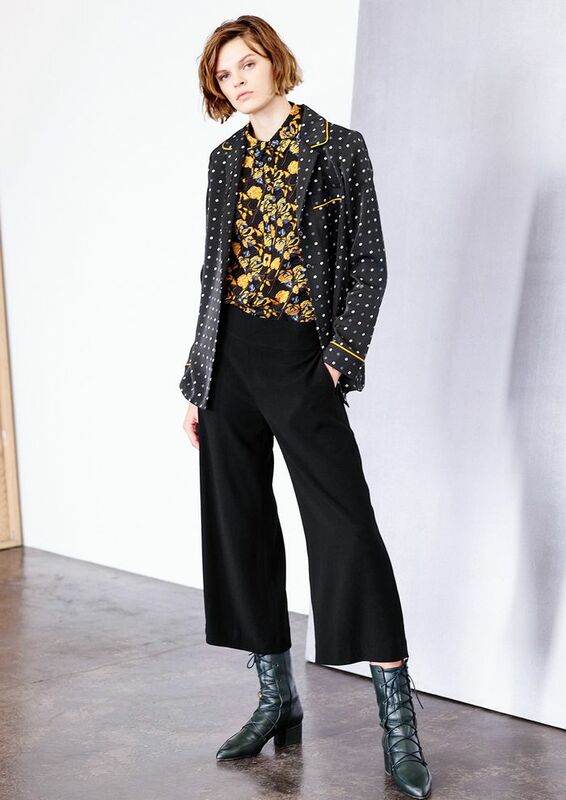 Thakoon thinks it's doable, and so do we. The designer's ready-to-be-shopped holiday collection is brimming with winter florals, cool tweed, and pajama sets you can (yes, can) wear to the office, on the weekend, and beyond. Keep scrolling to see our work-to-weekend picks. Don't save bright colors for the end of the week. Offset a vibrant floral blouse with darker hues to keep the look sophisticated. Nothing exudes weekend vibes like plaid, but with the right accessories, coat, and boots, this shirtdress can go from desk to drinks in a flash. We love how the marigold-hued tweed top and skirt transform into a dress when worn together. The structured quality of this cool puffer coat can't be beat. It's the perfect topper to take to work on cold days and run errands in on Sundays. If you're practicing pajama dressing at the office, look for subtle prints and tailored hemlines. Once the weekend arrives, pair the top with a great pair of jeans and loafers. A floral jumpsuit is not for the faint of heart, but we promise you it's worth trying. They're not just reserved for weekend wear anymore; add pumps and a sleek belt and you're office-ready. Which Thakoon piece are you eyeing? Tell us in the comments below.